Do you know your Beaujolais?! 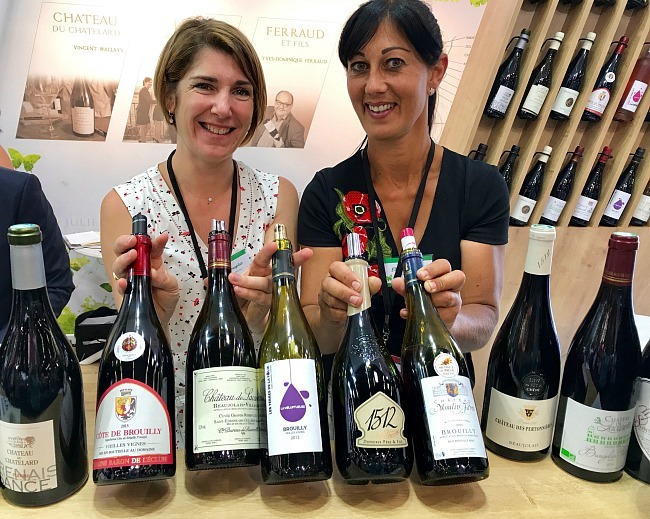 A new group of ladies emerged from the land of Beaujolais, with an inaugural kickoff at Vinexpo in Bordeaux last week. Unique and specific, their portfolio of wines is a hit. I met some of the woman behind Elles Et Beaujolais- they are a compelling force in the region. Céline Vernus (Rt), Ghislaine Dupeuble (Lt), and Céline Vermore (Center) are just a few of the women behind Elles Et Beaujolais. Château Moulin Favre, Château des Pertonnières, and Château de Lacarelle, respectively. Each of them touch all aspects of running a family winery, and then some. From vineyard to vinification, and sales and marketing to business development, they understand a stronger force comes by uniting. Although the ladies at Vinexpo were winemakers, the group is about more than wine. Other Elles Et Beaujolais members include chefs, restaurateurs, bed and breakfast owners and more. One thing they have in common is a love for the region, its heritage, gastronomy, and of course, the wine. When you live in an area for years, you get to know your neighbors and those farther away too. One introduction leads to another. Two conversations turn into three. Several of the women realized they could help each other be successful through the sharing of ideas and experiences- both positive and challenging. They all have thoughts about promoting not only the wine, selling, and exporting, but the Beaujolais region and its businesses. After discussions and acknowledging the feminine touch is different, Elle Et Beaujolais was established January 2014. It currently has 25 members. One program the group is completing will commence September 2018. They are working with specific Beaujolais area teachers and schools to educate children on the process of growing grapevines, understanding the winemaking process, and responsible drinking. Other ideas in the making include food and wine events, and wine tasting weekends. But understand these ladies are Gen Xers and millennials! They are confident, assertive and liberal in their approach while having a strong sense of local community. Who knows what other types of creative enotourism and gastronomy related events will surface. What I do know after tasting their offerings is this: they’re producing stellar wines from Beaujolais AOC through Cru Beaujolais. 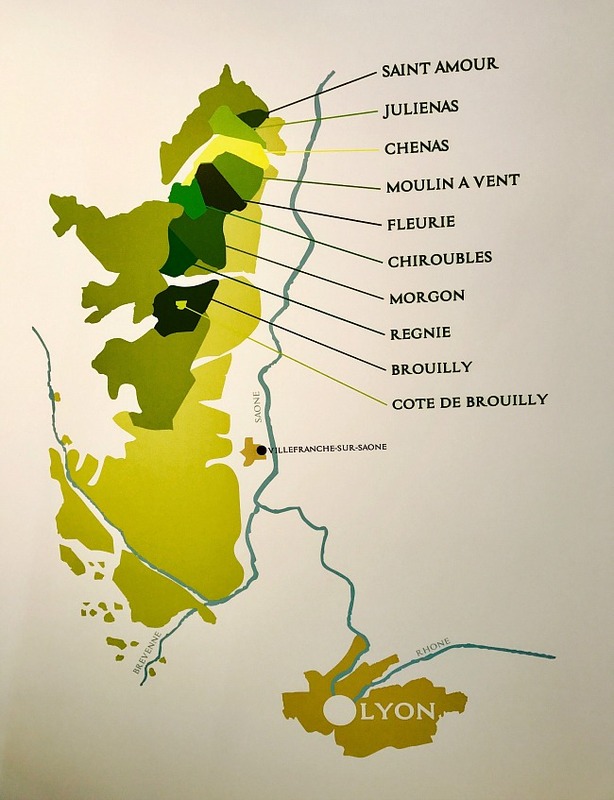 Beaujolais AOC wines (Beaujolais, Beaujolais Supérior, Beaujolais-Villages, and Beaujolais + named commune are all under one AOC) are generally lighter to medium+ style red from the Gamay Noir grape. They have lively fruit and acidity with a blush of tannins. Reds from Beaujolais-Villages tend to have deeper berry fruit flavors and a core of minerality as the AOC zone lies on granitic soils. And the Beaujolais Crus- they’re 100% Gamay Noir ranging from full-bodied and complex to delicate, floral and aromatic, with delicious fruit and great structure. Most have excellent aging potential and the best part- they’re great with food! Beaujolais is also about whites and rosés. Just a small amount and harder to find- about 4% of total wine production- Beaujolais Blanc and Rosé are worth the search! 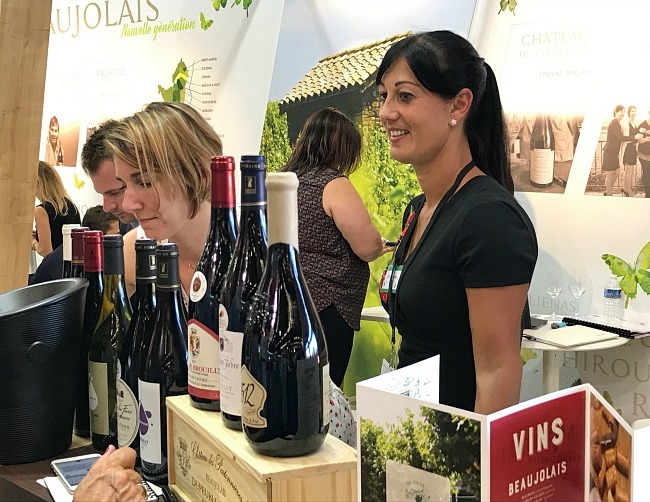 The five Elles Et Beaujolais wineries who attended Vinexpo produce red, and a small about of white, rosé, and sparkling wine. (I was particularly stuck by the Beaujolais Blanc and Rosé- stay tuned for a future post!) The region- which is beautiful- and its wines have made many a headline. The ladies in this group are taking those headlines mainstream. A special thank you to Vinconnexion and Michèle Piron! Loved reading about this cooperative effort among female business owners in Beaujolais. It sounds like they are really on to something – a strategy that will help all of them grow and succeed. I look forward to learning more about them and their plans. Glad you enjoyed reading about them Lauren. I will keep you posted on their future plans / efforts / etc. Excellent read! Inspiring story and mission. Although I’ve always found Beaujolais a little on the light side for my liking, you have now piqued my interest in exploring it with more of an open mind… based on what you shared, it will not disappoint. This is great! And learning more about Beaujolais is great too! I never had a very good impression of it, but willing to give it another try! I Learn so much from your blog! I hope you get the chance to try more Beaujolais Carol! I’d recommend one of the ten crus, happy to send you more information about them and the styles of wine. Also Beaujolais Blanc is a great alternative if you are looking for something to try different from the usual suspects. The French #Winophiles are heading to Beaujolais in November so keep an eye out! What a wonderful article about these women. As you know, I’m learning more and more about Beaujolais-I can’t wait to continue my journey! Thanks, Lynn! Thanks for your comment Cindy- highly recommend seeking out the wines these women make, different styles, bright worthy wines.